There are two cemeteries at Redland Bay. The older one which was designated as a cemetery in 1890, is at Serpentine Road and was transcribed in December 1996. 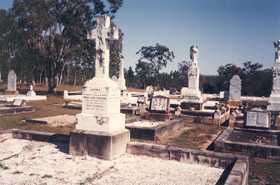 Few headstones remain, and the earliest death recorded is in 1896 for J. S. The main cemetery, gazetted in 1909, is located at Gordon Road, Redland Bay. The transcription of headstones in January 1997 indicates that there are some inscriptions pre-dating the gazettal of the cemetery.